Today, let’s turn our attention to fate. Everybody works hard towards achieving a good and happy life. However there will be many unexpected turns in your life’s journey. When a person comes up to any of these turning points in life, wisdom is very much required to make the correct choices. Palmistry can indicate when these events may happen to us during our life. 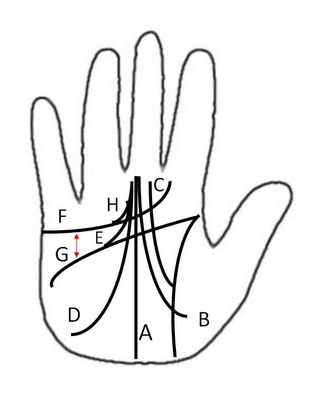 The fate line starts around the middle of the wrist and runs across the hand until the base of the middle finger (see A in the diagram). However this line may not appear clearly with 70-80% of people, or it may actually start from a different place. This is an indication that life is not always predictable. In examining the fate line, there are six major points to consider. 1. Generally speaking people who have a strongly visible fate line most probably have a good family background and education, and are people who can apply their talents in both daily and career situations. 2. Physical, emotional and mental support from family members and relatives is shown by a line inside the lifeline in the Venus sector of the hand (see B in the diagram). The existence of this line indicates that your fortune will be enhanced by this factor. 3. You are likely to be an independent person who can only rely upon one’s own effort if you have a line jutting out from the lifeline (see C in the diagram). 4. The line starting from the Lunar sector of the hand (see D in diagram) indicates that your friends or spouse are likely to play an role in your success. This line also indicates you charisma, an important element in success. 5. If the fate line starts from the wisdom line (see E). In these cases this means that life will be a struggle until into your early 30s. After that point life will dramatically improve and be easier. The distance between the heart line (see F in diagram) and wisdom line (see G in diagram) indicates the turning point in your life. Generally speaking if the gap is wide you may have an early turning point, say around 30 years old, whereas if the gap is narrow you may have a later turning point in life, say around 35 years old. 6. The line jutting out from the heart line (see H in diagram) indicates the struggle that you undergo in your life until your mid 50s. However the exact time in life that life gets easier for you is difficult to read from this line as actual timing depends upon other factors like the size of your hand, etc. Fate lines vary in their consistency. Sometimes the break and the fate line is made of two or more lines that overlap. This can also be another indication of turning points in your life and may indicate that you may face multiple turning points during your life. The advantage of being able to read your fate line is that it provides you the time to plan for the future. To some extent fate is in your hands and reward and success depends upon the efforts and hard work you put in, and decisions you make at the turning points you face. Please remember if your fate line doesn’t look good, that is not crucial to your success. The crucial factor is the effort you put in, and your fate is in both your hands. Dr. Harada, to paraphrase the question I proposed in part 2 or your interesting palmistry proposal, it remains ambiguous and rather unclear to me whether or not you are saying that fate determines our destiny and it is written on our hands, or that we can change our destiny with our free will, if indeed we have free will.